Specialists vs. Generalists: How Do They Fare in the Labor Market? First, in labor markets with strong institutional screening mechanisms, specialization won’t be as valuable. In the absence of other information, it’s an important indicator of skill, but graduation from a top MBA program is a strong signal to the market that someone is qualified. In that scenario demonstrating consistency is no longer advantageous. Second, employers may discount experiences that incrementally extend previous efforts. Among MBAs, there’s now a strong emphasis on building a consistent profile as a finance person or a marketing person. You end up with many similar people in the market. Specialization becomes commodified, giving you less bargaining power, because you’re easily substitutable. Plus, when the firm is used to hiring a lot of people like you, it’s easier to calculate your value compared with someone with diverse accomplishments. Clearly, some jobs require specialists. We cannot generalize these findings to all circumstances in the labor market. However, the research does remind us that the trend toward specialization in education and training may be counterproductive in some ways. I don't think that the findings suggest that we should ignore the development of specialized skills though. We need to educate students with breadth and depth. I don't think it's either an either/or proposition. We need students to have distinctive skills that employers value and that can enable them to hit the ground running when they enter the workforce. However, we want them to have a broad background that enables them to make connections among ideas in various domains, and that enables them to put their work in context. We also need them to be able to work with others who have different skills, backgrounds, and experiences. At Bryant University, we require our undergraduate business students to complete an extensive general education curriculum, AND we require them to minor in a liberal arts and/or sciences area. Thus, our finance graduates come out with minors in areas such as history, political science, or psychology. We believe that this combination makes them highly valuable as they enter the labor force, and our placement statistics confirm the validity of those beliefs. The researchers analyzed all 886,000 trade-related decisions and 1,234,822 IMs from 30 professional day traders over a two-year period. They also tracked each trader’s median daily profit—the best measure of trading performance. IMs were coded for level of emotion, based on the specific words used. For example, “nice,” “gold,” and “hit” were associated with moderate levels of emotion. Several points are worthy of emphasis here. First, people do like to discuss situations with others before making risky choices. Those discussions reveal something about their emotional state. Second, removing all emotion from a decision - being "super rational" - is not the answer when it comes to improving the quality of choices we make. Third, perhaps we can use various tools to monitor the emotional state of people tasked with making very risky decisions. One tool might be an evaluation of key words used in their digital communications. Budweiser has been making a concerted effort to shake up its image in recent years with bold marketing campaigns. The brand has been losing market share for more than 25 years as younger drinkers increasingly opt for pale ales and cocktails over the King of Beers. 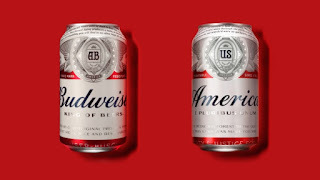 The company’s “Brewed the Hard Way” ad, launched during the 2015 Super Bowl, criticized craft brewers for making beer to be fussed over while Bud brewed beer “for drinking.” This summer’s packaging builds on that by framing Budweiser as more American than competitors. 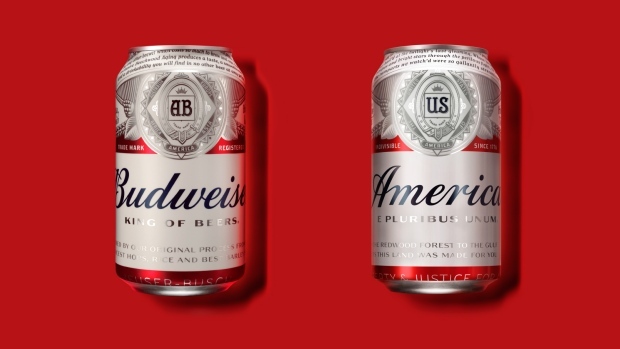 “This is bold and new,“ said Ricardo Marques, vice president, Budweiser. He added that the brand needs “to surprise” consumers, especially during the key summer sales month. Budweiser clearly is searching for ways to combat the loss in market share. The brand has lost share both to light beers in the mainstream portion of the market, as well as the emergence of a strong craft beer segment in the industry. Bud Light displaced Budweiser as the top beer brand in the U.S. in 2001, and Coors Light overtook Budweiser for the second spot ten years later. Meanwhile, craft brews accounted for more than 10% of the market for the first time in 2014. 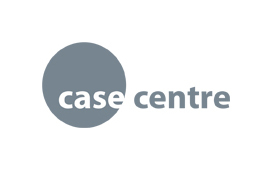 What are the risks of this rebranding campaign? The Financial Times reported on a few potential downsides in an article this week. Here's my take. First, it might seem odd to actually take your brand's name off of the product. Will people still recognize it on the shelf? I don't think that is a problem at all. The Budweiser can is iconic. People will easily spot it on the shelf. Perhaps more seriously, one has to wonder whether some customers will complain since Budweiser is no longer owned by an American company. AB Inbev is the parent company, and it's based in Belgium. Finally, how might the rebranding play out on social media? Could the campaign shift in unexpected directions, particularly as an incredibly unpredictable and perhaps tumultous US election campaign unfolds? The rebranding is a bold effort to jumpstart a slumping brand, but it does have some potential risks. Executives might feel that they have no choice. Miller's core brand was once Miller High Life. Look what happened to that once iconic brand. For more on this issue, check out my Facebook Live chat with The Great Courses. For the past several years, I have re-run this old post with some advice for new college graduates. I hope my students at Bryant University, and seniors at other institutions, will read and ponder these thoughts. Congratulations to the Class of 2016! 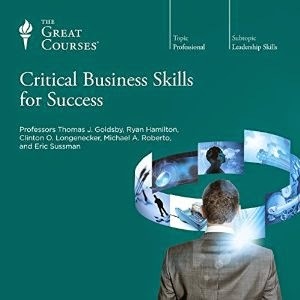 May you achieve great personal and professional success. Leader Self-Awareness: Do You Understand Signals You Are Sending? I continue to be amazed by the extent to which many leaders fail to recognize the signals that they are sending through their actions. Consider the following situation. A leader gives a variety of speeches and presentations in which he says XYZ is the highest priority for his or her organization. That particular leader then spends a disproportionate amount of time and energy focused on another objective/activity of the organization. He or she recognizes accomplishments with regard to the letter, while offering few moments of celebration or recognition for those who are achieving progress now what was allegedly the highest priority of the firm. Employees pay attention to how you spend your time, what you celebrate or recognize, what you are passionate about, and even the order in which you address topics during speeches or presentations. You can't say one thing and do another without someone noticing. In fact, a lot of people will notice. As the disconnect becomes apparent, you lose credibility as a leader. In many cases, leaders simply do not have the self-awareness to understand the extent of this disconnect. The signals they are sending are indeed rather subtle. Nonetheless, people notice. You have to understand the symbolic nature of your actions. You have to put yourself in the shoes of your workforce and understand how they might interpret your actions. Why Do We Stick with Poor Hiring Practices? The unwillingness to give up a much-loved evaluation approach seems to be driven by two factors: Managers are overconfident about their own expertise and experience, and they dislike deferring to more structured approaches that might outsource human judgment to a machine. Bohnet argues for much more emphasis on procedures such as work-sample tests, structured interviews, and comparative evaluation. These procedures help overcome many of the biases inherent in the unstructured interview process. Lands' End: Another J.C. Penney Scenario? 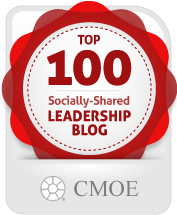 Columbia Business School Professor Rita McGrath asks an interesting question on her blog this week. She ponders whether the situation unfolding at Lands' End may be eerily similar to the fiasco that took place at J.C. Penney when Ron Johnson was hired as CEO. She's commenting about a Wall Street Journal feature story about the culture clash taking place at Lands' End as new CEO Federica Marchionni attempts to revitalize the apparel retailer. The former Ferrari and Dolce & Gabbana executive has taken over as CEO of the Wisconsin-based retailer, and she's trying to make the brand more fashionable. She tells the Wall Street Journal that her goal "is to evolve Lands’ End into a meaningful, global lifestyle brand.” The key question: Can she reignite growth at the firm without alienating traditional customers as well as her long-tenured employees? As part of her contract, the Lands’ End board agreed to let Ms. Marchionni work primarily from an office in New York’s garment district—an arrangement that rubbed some in Dodgeville the wrong way, according to former employees. Her employment agreement says she must be in Wisconsin for holiday parties and other social events that the Lands’ End CEO “historically has attended.” Joining her in Manhattan is a small group of fashion veterans including Joseph Boitano, a former Saks executive who serves as the company’s chief merchandising and design officer. The CEO ordered up a slate of new ads to run in the September issue of Vogue and other fashion titles. She commissioned celebrity photographer Bruce Weber to shoot a major holiday campaign. The full-page newspaper and magazine inserts showed patrician-looking models in coastal settings. Spiked red heels now featured alongside comfy slip-on moccasins. Professor McGrath acknowledges that Lands' End faces substantial challenges and needs to change. She wonders, however, whether Marchionni can lead in a way that brings her people along. Can she create an inclusive vision for the key employees? Or, will culture eat her bold new strategy for lunch? I don't know the answer to these questions, but I cannot imagine how leading a company from 1,000 miles away makes much sense. It creates problems at two levels. First, symbolically, it sends a message to employees that you don't want to engage with them, be available to them, etc. Second, substantively, it isolates you from the rank-and-file, making it more difficult for critical information (including bad news) to reach you in a timely manner. This week marks the 20th anniversary of the tragedy that took the lives of Rob Hall, Scott Fisher, and other members of their expeditions. Many of you may have read Jon Krakaeur's book, Into Thin Air, which chronicled the events of May 1996 in detail. 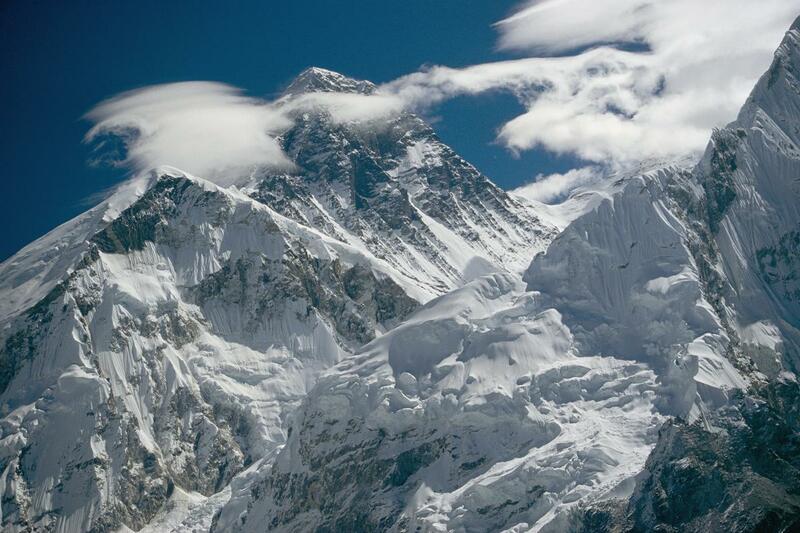 Others may have watched the Everest movie that came out last year. Still others have seen the tremendous documentaries produced by David Breashears about the events of May 1996. As most of my blog readers know, I've conducted extensive research on the decision-making processes of Everest climbers. As part of that research, I've spent a considerable amount of time learning about the events of May 1996, including through multiple conversations with the leaders of the IMAX expedition team, Ed Viesturs and David Breashears. Ed and David turned around, while the Hall and Fisher teams continued up the mountain. Later Viesturs and Breashears helped rescue the survivors of the tragedy that took place when a blizzard occurred. What are some lasting leadership lessons from that tragedy? 1. Great leaders exercise restraint. As David Breashears has told me, the best leaders don't simply order you up the mountain no matter what. They listen to others' ideas before expressing their views. They must be willing to gather input from a variety of people. Unfortunately, he says, some leaders are not willing to listen to dissenting views. The best leaders create a climate of psychological safety, where everyone is willing to speak up. After gathering input and advice from multiple sources, the leader can make a more informed and thoughtful decision. 2. Great leaders don't attribute all their past success to their own qualities and choices. Instead, they acknowledge that past success hinged upon favorable environmental conditions, a strong team to support and assist them, an effective support network back at base camp and at home, and a significant dose of good fortune. 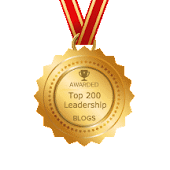 When leaders begin believing that past success is all about their own excellence, and fail to recognize other contributing causes, they get in big trouble. 3. Great leaders recognize how cognitive biases can impair decision making, particularly in stressful situations. They don't escalate commitment to failing courses of action in the presence of substantial sunk costs. In other words, climbers don't simply keep climbing because they have put so much into the expedition (money, effort, time, and other resources that they cannot get back). You can't look back; you must look ahead. Don't keep moving forward simply because you don't want to waste the investment you have already made. Don't throw good money, or good effort, after bad! 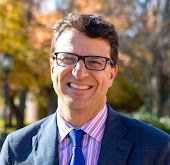 Other biases include confirmation bias (looking for data that confirms what you already believe) and compensatory behavior (taking more risk because you know a safety mechanism or system redundancy is in place; in Everest's case, carrying supplemental oxygen can create a false sense of security according to Ed Viesturs). 4. Great leaders don't build rigid plans. As Dwight Eisenhower once said, "Planning is everything. Plans are useless." In other words, be incredibly prepared. Be ready for all scenarios. Prepare meticulously. However, once the execution of your plan begins, be ready to adjust and adapt to conditions on the ground. Don't build a rigid plan in a turbulent environment. Retain flexibility. Don't just try to work harder to "get back on plan" when things start unfolding in ways you did not predict. In fact, great planning is not about predicting the future. It's about preparing for multiple scenarios that might unfold in the future. 5. Great leaders build a team around a shared vision, not simply a common goal. What do I mean by that? The Hall and Fisher expedition team members certainly all had a common goal: to reach the summit (we might argue that the more appropriate goal is to return safely to base camp). The problem, though, is that each person was focused on their own personal attainment of that goal. They didn't strive necessarily to achieve the summit as a team. Contrast that with the shared vision of the IMAX team there in May 1996. They strove to put a fifty pound camera on top of the mountain. They wanted to create a great documentary. It was not about individual accomplishment; it was truly a shared vision to create something extraordinary. For more of my work on the 1996 Everest tragedy, see the HBS case study that I wrote, as well as the California Management Review article that I published. 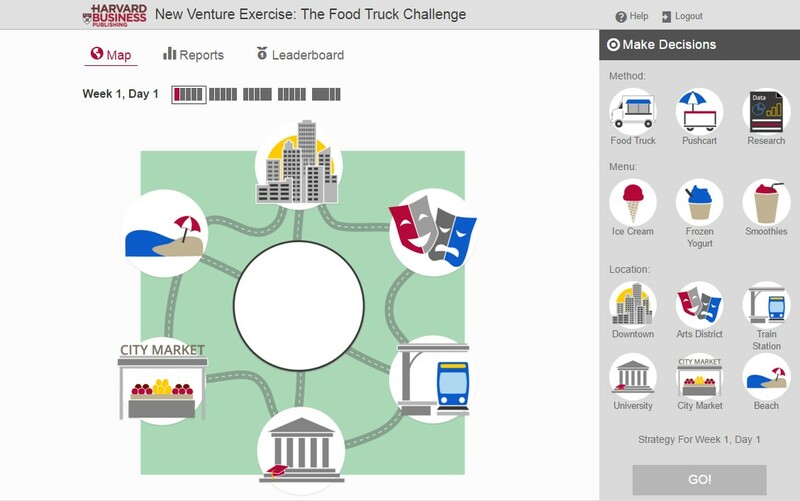 In recent years, I also co-created (with Amy Edmondson) the Everest Leadership and Team Simulation, available from Harvard Business Publishing. Avoid hedging language. Qualifying phrases such as “kind of” and hesitant language like “I think” can be beneficial in interpersonal communication, where they invite contribution and adjust your status relative to the person with whom you are conversing. But in contexts like presenting in public, they can reduce your credibility. Vocal elements include volume, rate, and cadence. The keys to vocal elements are variation and fluency. Think of your voice like a wind instrument. You can make it louder, softer, faster, or slower. We are wired to pay attention to these kinds of vocal change, which is why it is so hard to listen to a monotonous speaker. In fact, even just a 10% increase in vocal variety can have a highly significant impact on your audience’s attention to and retention of your message. Vital elements capture a speaker’s true nature — it is what some refer to as authenticity. For authenticity, Zandan’s team has found that the top 10% of authentic speakers were considered to be 1.3 times more trustworthy and 1.3 times more persuasive than the average communicator. Authenticity is made up of the passion and warmth that people have when presenting. Passion comes from exuding energy and enthusiasm. Imagine a hospital that discusses its mistakes publicly. Does that sound like a good idea? Could it help advance the cause of patient safety. Yesterday we learned that scholars at Johns Hopkins have conducted research demonstrating that medical errors are the third leading cause of death in the United States. That's alarming in its own right, but especially so since many hospitals have been trying to reduce medical accidents over the past decade. The Brigham & Women's Hospital in Boston has been trying to reduce errors, and now they have taken their efforts one step further. They have decided to go public with a safety blog that they have been publishing internally for several years. I applaud their courageous decision. Karen Fiumara, senior director of patient safety at Brigham and Women’s Hospital, explains the decision to go public about the hospital's mistakes. Hospitals celebrate their safety records, but rarely discuss their mistakes. Yet it’s difficult, if not impossible, to improve safety without identifying and learning from errors. That’s why Brigham and Women’s Hospital has launched Safety Matters. This blog aims to describe mistakes made at the hospital along with steps the hospital is taking to prevent them in the future. We began Safety Matters in 2011. At the time, it was an internal communication available only to Brigham and Women’s employees via the hospital’s intranet. One goal is to make sure that everyone on the staff knows that the hospital is committed to being open and transparent about mistakes and learning from them. Another goal is to convey that reporting mistakes is not only encouraged, but is also the right thing to do. Another element of some blog entries is the “Just Culture Corner.” It helps promote a culture in which hospital staff and patients feel safe and supported when speaking up about mistakes and risks. It’s now more accessible to the entire staff, and can be read from home or a mobile device. It demonstrates to patients, prospective patients, and other stakeholders that the hospital is committed to transparency and continuous improvement. It can be a resource for other hospitals in the United States and around the world to provide safer patient care. 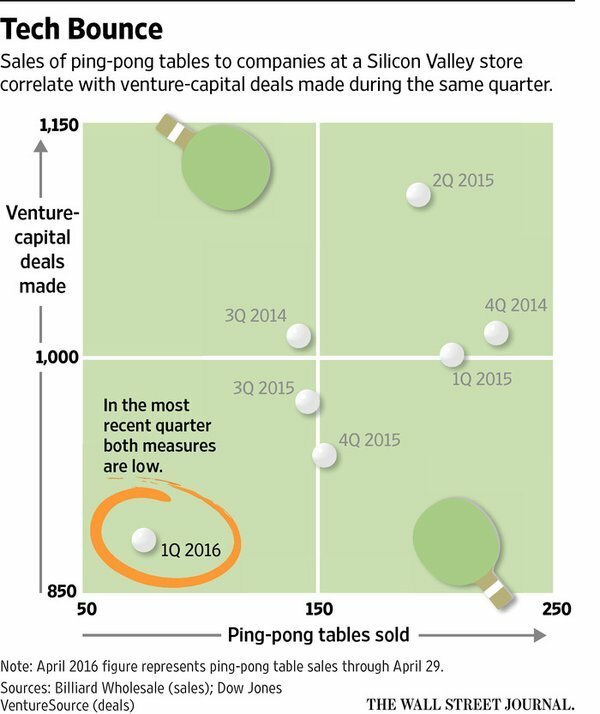 Do Ping Pong Sales Predict Tech Downturns? Zusha Elinson has written a fun and thought-provoking article in today's Wall Street Journal. The article is titled, "Is the Tech Bubble Popping? Ping Pong Offers an Answer." Elinson found that ping pong table sales decreased 50% in the first three months of 2016. Venture capital financing decreased by 25% in the same time period. Elinson cites information from retailers and wholesales indicating that firms such as Twitter, Intel, and Yahoo have all reduced or stopped their purchases recently. 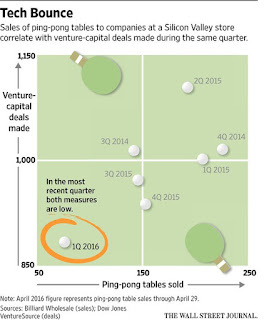 Is there any truth to the theory that ping pong sales are a leading indicator? Who knows?! However, it's worth noting that many large companies have purchased ping pong tables (and other games) in recent years, in hopes of emulating the culture of start-ups in Silicon Valley. They have learned a hard lesson. Buying ping pong tables does not create an innovative culture. In fact, it does nothing really unless you transform the fundamental attitudes, beliefs, and values of the organization. In fact, you create a skepticism in many employees if you add ping pong tables, but fail to change the shared norms, expectations, reward systems, and leadership style of the organization. They see the move for just what it is - a superficial attempt to influence employee satisfaction without an underlying shift in how work actually gets done. Many people often think that creativity flourishes when people are not constrained in any way. Give people total freedom to think and generate ideas, and they will be highly creative. That's the conventional wisdom. However, some research shows that constraints actually can enhance creativity. The Boston Globe reported this weekend on a study by Catrinal Haught-Tromp. The forthcoming article is titled, "The Green Eggs and Ham Hypothesis: How Constraints Facilitate Creativity." The scholar chose this title because the highly creative book by Dr. Seuss only uses 50 words. Haught-Tromp conducted experiments to examine whether constraints can stimulate creativity. Haught-Tromp asked the research subjects to develop two-line rhymes for greeting cards. In some circumstances, she required the subjects to include a particular noun in their rhyme. Outsiders judged the rhymes developed with this constraint to be more creative. Moreover, she found that subjects working without the constraint tended to be more creative when developing a rhyme after they had worked in the constrained condition (as opposed to before they faced the constrained condition). The constraint did not just generate more creativity in the moment; the effect seemed to persist. Is there a practical example of how constraints can fuel creativity. Consider IDEO, one of the world's leading product design firms. At first glance, when you walk into their offices, you might think that they provide their staff members the freedom to design as they wish. However, a closer look reveals a clear method/process by which they work. Moreover, as IDEO staff members brainstorm, they follow certain ground rules for how such sessions should take place. In short, constraints do exist at the firm, and they seem to enhance rather than detract from the creativity of the solutions that they design. Funny Take on Interview Mistakes! We wanted to use our discussions with managers and a review of the literature to understand how employee attitudes and behaviors affected company performance. This led us to define employee engagement as “a multidimensional construct that comprises all of the different facets of the attitudes and behaviors of employees towards the organization.”7 The five dimensions of employee engagement are: employee satisfaction, employee identification, employee commitment, employee loyalty and employee performance. After controlling for other relevant factors including GDP level, marketing costs, the nature of the business and the type of goods, we found that the highest level of growth in profits (10% to 15%) occurred in the group of companies whose employees were highly engaged; the lowest level of growth in profits (0% to 1%) occurred in the group of companies whose employees were disengaged.